Grades 7 and up or if you have a child ready for Pre-Algebra. If you want to know if your child is ready, preview this VIDEO. VideoText Interactive offers Algebra and Geometry in the form of a Video Textbook instead of the traditional textbook. They offer short videos using animation and graphics to walk you through the lessons. There is an option for the online version or DVD with Printed materials. Both are complete. There is also an option for buying modules in stead of a complete course. For this review we will be discussing Algebra: A Complete Course, the online version. 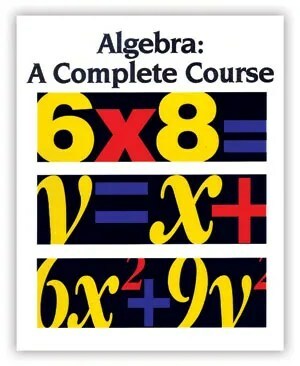 This course starts at Pre-Algebra through Algebra 2. You have 3 optional pacing plans of 1 year – 3 years. The program focuses mastery of the concepts with the use of 176 video lessons, Course Notes, Worktext pages, manuals, and tests. They won’t teach you tricks and shortcuts because they really want your child to master the concept and the “why”. The program really cements the concept so your child won’t forget. The course can be completed with minimal parent involvement as you wish to give. On the website, they offer some free resources such as printing off graph paper (link to another site), progress checklists, and extra practice problems if needed. At first, I was overwhelmed with this program. There is a lot of information to read before starting it. All this information had me thinking this program was going to be hard to follow. As it turns out, it’s easy! After you sign in to your account, everything is listed in the left hand side bar. You click on where you need to be and when you finish there is a button at the bottom that you click to go on to the next page. I found it pretty self explanatory to follow. Click and go. I am the type of person who likes details, but I really like them straight forward and simple with the least amount of words as possible. I found the information explaining the program was “too much information” for me. A simple “do this, do that, then do this” would have been better for me to feel confident about how we were going to follow this. So trust me, its so simple to follow. It is also easy to put in your planner, if you keep one, because there is a system to it depending on the pacing option you chose. We started out following the 3 year pace option, but some days they wanted to move forward to the next lesson, so I let them. I feel this program is really a “go at your own pace” program. One of the aspects of the program is for your child to correct their own mistakes, which shows them where they went wrong and they can learn while correcting it. This may be new to some kids, but my kids are use to doing this so it is normal to them. When we get started each day, we always print out, or at least open them in new windows, the course notes and the WorkText pages and 3 hole punch them for a binder. We use this binder to keep track of each child’s work and keep the course notes handy for each lesson. When we were not able to print, for lack of printer paper, they copy their work on to notebook paper. I personally like printing the pages out as this helps keep them accountable on their work and they can’t skip or “forget” a problem. One thing we would really like though, is a workbook with the WorkText pages so we don’t have to print or copy anything. They offer this on their site and you can purchase per module or by complete set. This is something we may look more into. The videos are medium paced, not too fast or slow where you could get lost. My girls liked to watch the video first all the way through, then they would get the WorkText pages out and work through with the video. They figured this out pretty quickly and they both agreed that this was helpful for them. My daughters like the program, but my eldest daughter would rather have an actual textbook because she likes to read it and work things out. She really does not like watching videos, unless she needs to, so I find her using just the course notes. She has a high comprehension rate so this works for her. As she progresses, she may find herself needing to watch the videos. My youngest is the visual learner, and needs more time going over things, so she uses the video. She still wants someone there to help explain things if she isn’t confident that she is grasping it. Which brings me to something that rarely happens around here. My eldest is actually helping the youngest with the work, explaining it for her and actually showing her what to do. They are working together peacefully. They both have been able to work at their own pace, with the oldest daughter working faster by doing her quiz and then starting the next lesson, while the youngest does her quiz and waits for the next day to do her next lesson. I really don’t like them to start a lesson on a Friday so unless there is a quiz for Friday, I don’t have them start another lesson. We have been reviewing the last lesson on Monday if needed by watching the last video or going over the course notes. We will continue with the program because I do think its worth it. My girls are learning and I think it is a great program. I will be looking into purchasing the workbooks though to save on printing them out. I recommend checking out the FAQ page because it does have a lot of useful information that I tend to read over when I need help or encouragement in how to use this program effectively. There are lots of nuggets in there. 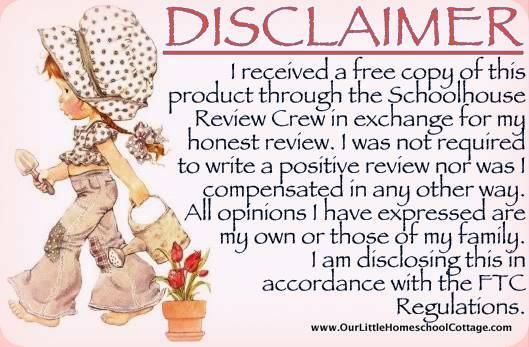 This entry was posted in HomeSchool Review, Homeschooling, Review, TOS Crew Review. Bookmark the permalink.